When you have a cold or are suffering from allergies, tissues are a must-have, but the cost can rack up when you're buying them all the time. Have you ever considered using toilet paper instead? Here are a few good reasons why you should. 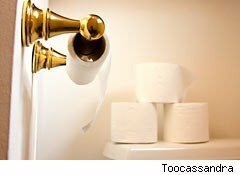 We've all grabbed a few squares from the bathroom roll in a pinch, but using toilet paper over tissues is actually a more cost-effective choice in the long run. On average, a box of tissues has 65 sheets and breaks down to about 2 cents per sheet. However, a roll of toilet paper has nearly four times as many sheets as a box of tissues and costs half as much. Of course, you're not going to toss a roll of toilet paper to your guests when they have the sniffles. With a pair of scissors, an empty tissue box and a little bit of tape, you can refill your dispenser to look just like a store-bought version. First, take a roll of toilet paper and cut down the length of the cardboard center with your scissors. Remove the tube. Take an empty square tissue box and cut three sides along the bottom. Pull the inner sheet through the top and tape the bottom shut. You'll have a great looking tissue box in minutes, and can count your savings with each and every pull. And that's nothing to sneeze at!